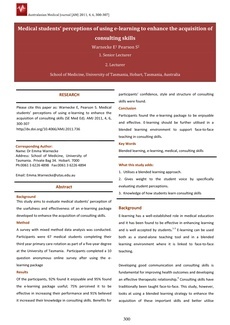 Background This study aims to evaluate medical students’ perception of the usefulness and effectiveness of an e-learning package developed to enhance the acquisition of consulting skills. Method A survey with mixed method data analysis was conducted. Participants were 67 medical students completing their third year primary care rotation as part of a five-year degree at the University of Tasmania. Participants completed a 10 question anonymous online survey after using the elearning package Results Of the participants, 92% found it enjoyable and 95% found the e-learning package useful; 75% perceived it to be effective in increasing their performance and 91% believed it increased their knowledge in consulting skills. Benefits for participants’ confidence, style and structure of consulting skills were found. Conclusion Participants found the e-learning package to be enjoyable and effective. E-learning should be further utilised in a blended learning environment to support face-to-face teaching in consulting skills.